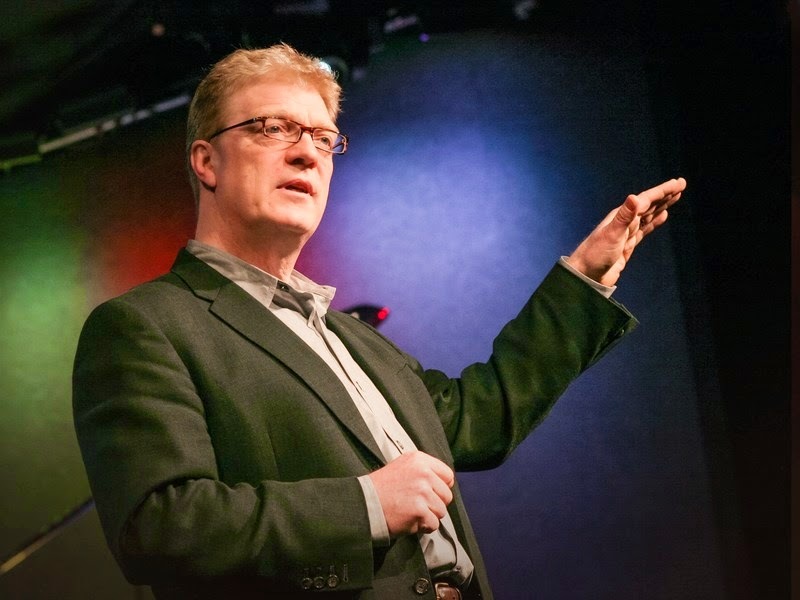 Donald Clark Plan B: Sir Ken Robinson: ‘Creative’ with the truth? Do schools kills creativity? Sir Ken Robinson (we’ve learnt to be wary in the UK of anyone whose first name is ‘Sir’) has achieved saintly status through his three TED talks, RSA animation and very many keynotes at 45k a pop, on this very subject. It is difficult to go to any educational conference without being assaulted by the accusation that ‘Creativity’ has been sacrificed on the altar of traditional education and schooling. Robinson’s main thrust is that all children are born ‘creative’ and that school knocks it out of them. I'm not so sure. This is hardly new. Rousseau (my summary here) wrote an entire novel on the subject, the rarely read Emile (On Education), defining the concept of the essentially good ‘noble savage’ corrupted by civilisation and schooling. You may question the wisdom of a man who handed over all five of his children at birth to an orphanage, but the idea has endured and Robinson is just the latest in a long line of Rousseau acolytes. Teachers may be surprised to learn that Rousseau’s concept is to largely avoid teachers and schooling until around the age of 12, even then the book is largely negative about ‘teaching’. Children should not be taught but rather learn from the natural world and through problem solving. He also puts forward a strong, if not progressive, case for women being essentially different, needing a different approach to education, from men. Having encouraged the idea of romantic naturalism and the idea of the noble and good child, that merely needs to be nurtured in the right way through discovery learning, he paints an over-romantic picture of education as natural development. The Rousseau legacy is the idea that all of our educational ills come from the domineering effect of society and its institutional approach to educational development. If we are allowed to develop naturally, he claims, all will be well. This is an over-optimistic view of human nature and development, and although not without truth, lacks psychological depth. Emile, as Althusser claimed, now reads like a fictional utopia. This romantic naturalism has led to a more recent form of hopeless utopianism, as espoused by the likes of Sir Ken Robinson and Sugata Mitra. Robinson, at least just talks in abstract generalities with anecdotes, Mitra is far worse, as his hole-in-the-wall projects are dangerous fictions (my critiques here), that really do undermine teaching and teachers. Creativity has proven to be a remarkably elusive concept, used in a wide range of senses and contexts, sometimes to describe a process, product or person. Often confused with innovation, it is a chameleon term. The word has received extra impetus in these rapidly evolving, technological times, boosted by the Silicon Valley narrative of teenage millionaires and talk of the relentless push for entrepreneurship and innovation. This dangerous fiction is our 21st C form of romantic naturalism. It is now expressed in educational circles as the need for 21st C skills, but beware of big, abstract nouns, being expressed as skills. ‘Creativity’ has become a cipher for almost everything and, I fear, nothing. Attempts have been made to pin ‘creativity’ down but even these tend to be ignored in favour of a vague ‘let things rip’ idea of artistic creativity. For example, the often used ‘Standard Definition for Creativity’ invokes both originality AND effectiveness (or usefulness). In other words, originality is a necessary, but not sufficient, condition for creativity and innovation. Even this definition is open to doubt, as other factors such as judgments and decision-making come into play. In other words, dreaming up lots of uses for paperclips is not a reliable indicator, on its own, for creativity. Are Robinson’s anecdotes (as his talks are largely anecdotal) really anything more than the simple denial of the reality of child development? As Sawyer notes in his key text, Explaining Creativity (2012), it is easy to get sucked into the romantic notion that young children, because they come out with odd verbal statements and do things that seem off-beam, display essential creativity. In fact, it may only reflect normal child development and attempts to keep children back in that developmental process may do more harm than good. The problem with Robinson’s Rousseau assumption, that we become less creative as we get older, is that the research suggests otherwise. We seem to become more creative as our brains develop and we become more capable in terms of flexible options and better judgements. It’s no use pushing for an educational system that produces lots of idiot savants, without the ‘savant’. Most people simply take the word ‘creativity’ at face value and see it as an intrinsic good. But that is not enough. Robinson mentions the “alternative uses test”, which was developed by Guilford in 1967. You’ve probably been subjected to this at some conference or condescending training course. I have and it was excruciating (the full tale told here). You’re asked to find as many uses as you can for say - a brick or paperclip, usually accompanied by some statement about being a ‘genius’ if you tip over a certain threshold number. That number, in practice, is hugely variable, but let’s not quibble. It is clear that the famous ‘paperclip test’ is not as useful as it seems. Research shows the common confusion between quantity and quality that such tests assume. In this study 'Productivity is not enough' by Rietzschel et al. (2006), they found that quantity of ideas was negatively correlated with feasible ideas. This is interesting. In other words, this test of creativity may merely be a test of wild imagination. I’m not saying this is a bad thing but let’s not confuse it with effective, productive and sustainable innovation. Another study by Kudrowitz et al. (2012) shows that a test for ‘creativity’ was influenced by the quality of presentation rather than the quality of the ideas. In fact, idea generation in itself seems not to be the key to innovation, building on early ideas, with knowledgeable iterations, seems to work better. At this point I become a heretic. In many cases in education, avoiding the ‘creative’ may be beneficial. Having taught maths to teenage boys, I’m pretty confident in saying that it is a narrowing down of options you need; a clear idea that the learner feels capable, intense focus, being on task, patience and persistence. Divergent or creative thinking tends to lead to cul-de-sacs and repeated errors. In maths, it is often the elimination of intuitive thought that leads to success, as this is the commonest cause of failure. In teaching physics you may also find that much of what the uninformed mind thinks is true, is in fact false, because physics can be counter-intuitive. For example, inertia is not a force, gravity pulls objects toward earth at the same constantly accelerating rate regardless of differing masses and so on. Even in subjects that are assumed to have ‘creativity’ at their heart, such as art, music and design, learning to draw, read music and have precise mathematical and technical skills may be the key to success at this stage, not the endless promotion of creativity. Let’s also consider creative activity in adult, workplace learning. Brainstorming, it seems, was doomed to succeed. The commonest form of supposed creative thinking in the workplace is the ‘brainstorm’. I’ve attended far too many of these, often organised by quangos, government agencies or departments, to harvest innovative ideas around policy and strategy. They’re unimaginative, follow a tired old script, and are largely a huge waste of time and money. Brainstorming was introduced to the world by Alex Osborne in 1948 through his book ‘Your Creative Power’. De Bruyckere, Kirschner & Hulsof, in Urban Myths (Learning & Education) expose its subsequent popularity, despite the fact that the research tells us it doesn;t work. Again, Sawyer comes to our rescue in Explaining Creativity’ (2012); “Decades of research have consistently shown that brainstorming in a group produces fewer ideas than if the same number of people had thought up their own ideas individually, before sharing them collectively.” Wow! That’s a damper on all those crap training sessions run with round tables, facilitators, choose a chair for each table and feedback to the middle nonsense. Here’s the bad news, it gets even worse. The research shows that the quality of generated ideas in brainstorming is worse than by using other methods. Nemeth’s study ‘The liberating role of conflict in group creativity’ (2003) shows that vigorous debate and evaluation help with creativity and innovation, not avoiding evaluation and conflict (that staple piece of advice given in brainstorms). Robinson blatantly uses data selectively and edits a graph is his memorable ‘Ritalin’ image from the RSA Animation talk at 3.47. 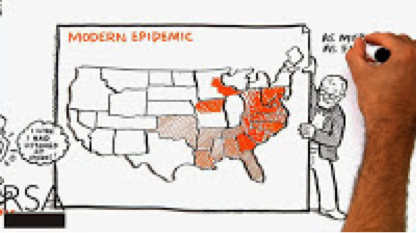 Robinson’s graph has no legend and he’s recalibrated the white states to look as if there’s zero prescriptions. With this data you have to look at the source to understand that the white areas represent states that did NOT participate in the study or did not have reported prescription data. It’s a distortion, an exaggeration to help make a point that the data doesn’t really support. This is a specific lie but the main problem with Robinson’s more general propositions is that there is no evidence or data at all. So often in education, shallow unsubstantiated TED talks replace the real work of researchers and those who take a more rigorous view of evidence. Sir Ken Robinson, is the prime example of this romantic theorising, Sugata Mitra the second. Darlings of the conference circuit, they make millions from talks but do untold damage when it comes to the real word and the education of our children. Sawyer R.K. (2012) Explaining Creativity Oxford: Oxford University press. Rietzschel, E. F., Nijstad, B. A., & Stroebe, W., (2006) “Productivity is Not Enough: A comparison of Interactive and Nominal Groups in Idea Generation and Selection”. Journal of Experimental Social Pschology, 42, pp. 244-251. Kudrowitz, B. & Wallace, D., (2012) “Assessing the Quality of Ideas from Prolific, Early Stage Product Ideation”. Journal of Engineering Design: Special Issue on Design Creativity, 1-20. Nemeth C. J et al. (2003) The liberating role of conflict in group creativity. Institute for Research on Labor and Employment. I love that you give us the critical view of things. It's really helpful to see this type of analytical thinking about things that we may otherwise take at face value. You make a good case refuting Ken Robinson brainwashing, but are the studies you mention valid? If so, what makes them so? Oh Donald - you do enjoy being controversial I want to reply to this more fully and may need to write a blog post in response. If I do get time them I will post a link here. I agree what he says is not a new idea. I think it pity to link him with Mitra though, which I see as quite different. Agree pretty well on what you say about creativity and the paper clip exercise (yes have been there myself in a awful session). That is another story for the blog perhaps. "Not all education should be creative" - yep ok! Does Robinson ever say that it should be? If so I have missed that. I find myself in an odd position that I agree with a lot of what you say BUT I do think that Robinson serves a very useful purpose for many teachers and educators and does more good than harm. Of course any speaker can picked apart and I think most people use statistics, charts and graphs to make their points - including the drugs companies (especially the drugs companies - I have some experience there from someone inside the industry). So ADHD - is it real or how many cases are just bored kids with weak teachers and poor curriculum driven by assessment? I could not disagree more with you mostly unsupported attack on Robinson, Mitre, and a learning vs teaching pedagogy. Assuming that I will not change any minds here regarding the case you've laid out I'll simply focus on the conclusion. Re: "So often in education, shallow unsubstantiated TED talks replace the real work of researchers and those who take a more rigorous view of evidence. Sir Ken Robinson, is the prime example of this romantic theorising, Sugata Mitra the second. Darlings of the conference circuit, they make millions from talks but do untold damage when it comes to the real word and the education of our children." The "real work of researchers?" Surely Robinson and Mitra didn't get invited to give TEDTalks on the basis of their good looks. They are both accomplished individuals. In Mitra's case he won a TED Prize to further research his ideas. Robinson has authored several well received books. And where oh where is this evidence of "untold damage?" You provide none. Robinson makes a simple claim in one of his TEDTalks, "We have built our education systems on the model of fast food." I agree with him, so "BRING ON THE EDUCATION REVOLUTION." Your picking the low hanging fruit here by being critical of Robinson's TEDTalks[s] and not his books. TEDTalks are brief 20 minute overviews of complex topics and by there nature are designed to leave the listener wanting to find out more. Can we be critical of Antonio Damasio's entire body of research into consciousness, or his two books on the topic, based of his TEDTalk? Not in any meaningful way. Can we judge whether Daniel Kahneman should have won the Noble Prize base on his TEDTalk? Of course not. If one was to analyze this commentary with the same rigor being apply to analyzing Robinson's ideas one might say that the objections here are neither new or sufficiently argued, and stop there. Robinson's talk did accomplished something, he has millions of people talking and thinking about education. So, I've put you right on Sugata Mitra. In other words, I did my site research and reading. You seem to assume that this one post was the only thing I've ever written on these subjects but you're wrong. On Robinson, I have read his books, unlike the vast majority of his TED viewers. You seem to ignore the fact that 1) the post posits a number of pieces of research, way beyond that of Robinson, that shows the weakness of his position 2) I fnd the books weak on reseach and also somewhat shallow. Too many assumptions mate. When you say my post is 'unsupported', I wonder whther you've actually read the post. It has citations and my argument about his faking the graph evidence is fully supported. You may be a Robonson fanboy/fangirl, but read what was written before making accusations. You're jumping around here and not addressing my concerns. Let's take one thing at a time; "where is this evidence of "untold damage?" It remains "untold" here. What damage? Sorry but it's you who jumps around. So far you haven't presented one argument, one piece of evidence or research and clearly don't read what I write. I have written extensively on this subject in the blog since 2006, explaining why 21st C skills based on abstractions, like 'creativity', are misleading. Do some reading, present some arguments, quote some research - do something other than state crass slogans in CAPITALS like "BRING ON THE EDUCATION REVOLUTION." I dont read Robinson as being for creativity per se but for a more flexible mode of educational delivery. Not everybody should be required to hit the same way points in education in lockstep. You reference Emile by Reauseaux. This is a bit of a straw man argument. You should also look at the Work of Rudolf Steiner or Maria Montesori. Both of these educators follow an alternative approach closer to Robinsons thinking, and both systems have active school communities with many thousands of effective graduates. Mathematics is a seperatte issue, and I would strongly contend that imagination is a key component of mathematical thinking at any level beyond routine computation. I have read and written on both Steiner and Montessori - they're on the sidebar of the blog. I have no doubt that flexibility is a virtue. But I don't ghink that repeating the mantra about 'creativity' is helpful. I've fought all my life for a balance of the vocational and academic and haven't found the Robinson line useful. It makes education sound woolly on policy. On maths.... well that'sa complex issue - but trite statements like 'imagination is a key component' is not useful. One small-ish thing I find bizarre is the way Ken Robinson turns reality on its head by depicting a belief in the importance of IQ as being the popular and prevailing view in todays's world - which he's brave enough to criticise. The reality - of course - is that almost no-one really dares talk favourably about IQ in public these days (people lose jobs, careers when they do! ), and fairly weakly-supported ideas like EQ and Multiple Intelligences are popular instead. The heroes today are the people who question today's orthodoxy (as you have done! ), and present something richer. I heard Robinson more recently and fortunately the poorly-evidenced utopianism stuff was rather tempered by some more complex thinking that wasn't too bad.